If it’s possible to platonically ship two celebrities, Chance The Rapper and Beyoncé are certainly prime contenders for such a thing. First, there was their adorable video bomb at an otherwise stilted MTV Video Music Awards. And then this weekend Chance took the time to serenade his beloved “auntie” during his set at Jay Z’s Made In America music festival in Philadelphia. He even projected a still from their VMA encounter on the screen behind him. 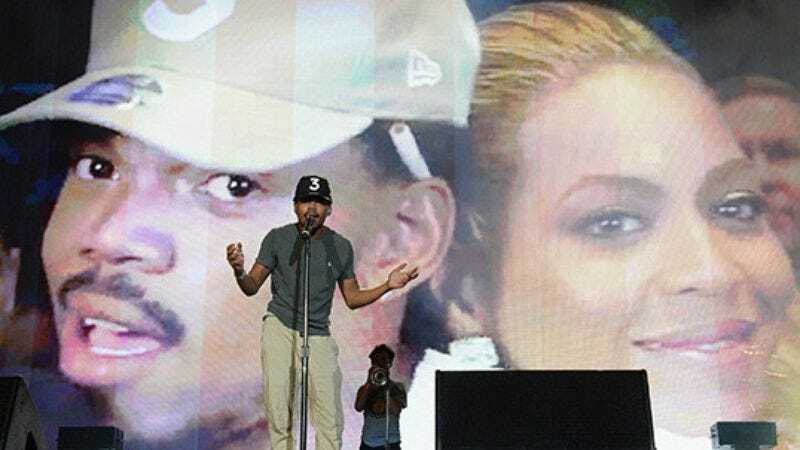 Although Chance didn’t wish “Yonce” better than her heart desires and her first kiss from a boy, his performance was inspired by Lisa’s birthday song from the iconic Simpsons episode “Stark Raving Dad.” Chance even confirmed as much on Twitter. Meanwhile, festivalgoers caught Beyoncé’s delighted, slightly embarrassed reaction to the serenade. Then Chance attended her Soul Train-themed birthday party this weekend, because their friendship chemistry is stronger than ever.